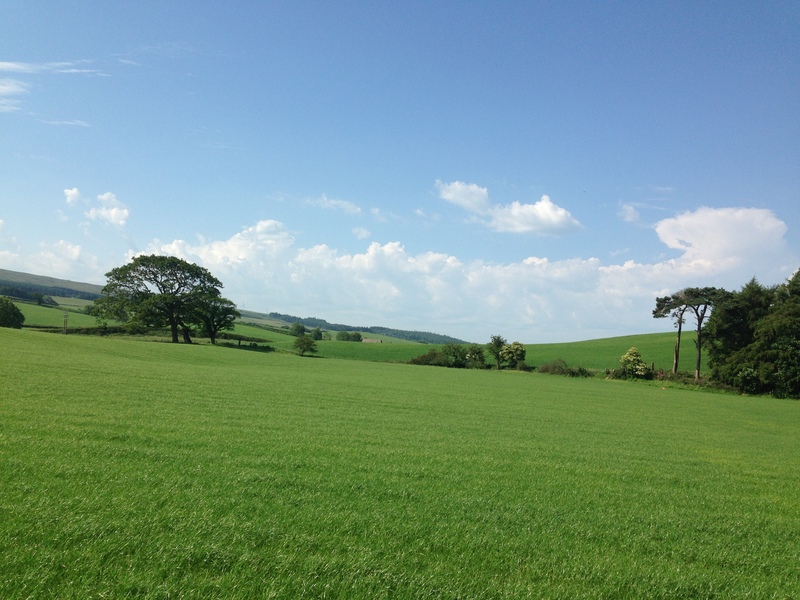 I’m spoilt as I’m surrounded by stunning scenery where I live, fields and quiet tracks branching out in all directions. Despite this I generally prefer road running. When I put my foot down I like to know it’s stable and it’s going to stay where I put it. I use my running for head space and I’ve always felt that if I have to concentrate too much on my foot placement then my mind will have less freedom to wander. I’d rather be thinking about what new challenge I’m going to set myself than considering whether a stone is going to wobble and send me into a large puddle. I also hate getting wet feet and it frustrates me that a lovely field of lush grass has the ability to turn my socks into damp squelchy sponges. So, being forced into taking to the trails I needed a new pair of shoes to replace my trusty old ones which I’ve had for so long I felt sure the trainer police would be knocking on my door any day. 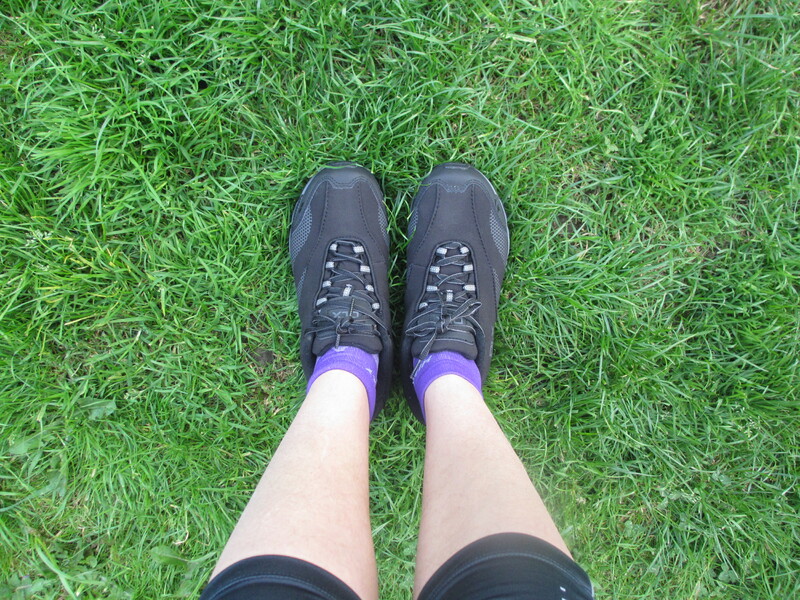 Trespass kindly gifted me a pair of Derulo DLX trail running shoes and asked me to review them. 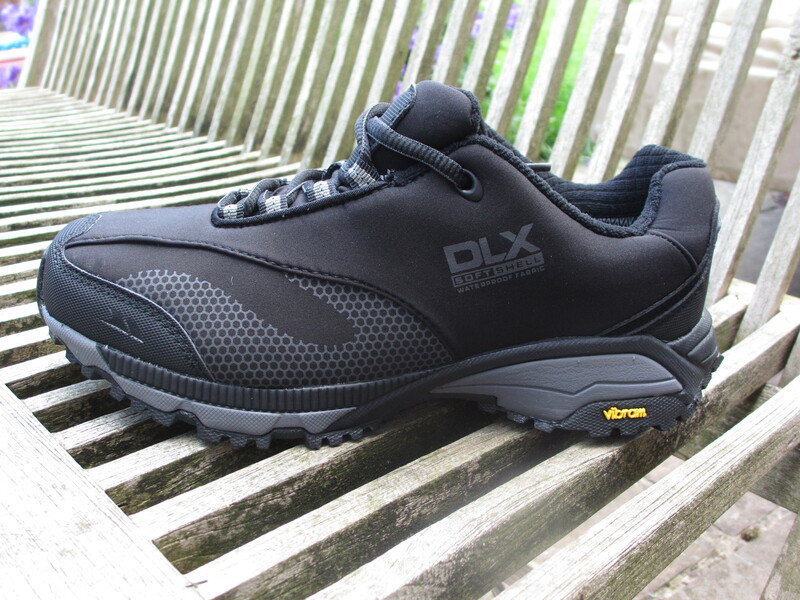 I needed shoes that were light and comfortable with superior grip and above all, they needed to be waterproof. Trespass is a brand I turn to again and again for well-priced outdoor gear, especially for my children. It’s not somewhere I would think of heading for a trail shoe. I set about testing them with gusto …… and Honey. DLX are Designed for Life’s eXtremes so I headed out for a trail run on a hot sunny day, a wet muddy one and a family river walk. I’m not sure Trespass were expecting such rigorous testing but if I’m reviewing something I’m going to do it properly! The shoe is lightweight but also sturdy. It immediately felt very comfortable. It’s a slightly chunkier trail shoe than I’ve had previously but this isn’t a negative as I felt reassured it would be strong and robust. I have quite a wide foot and the fit was perfect. 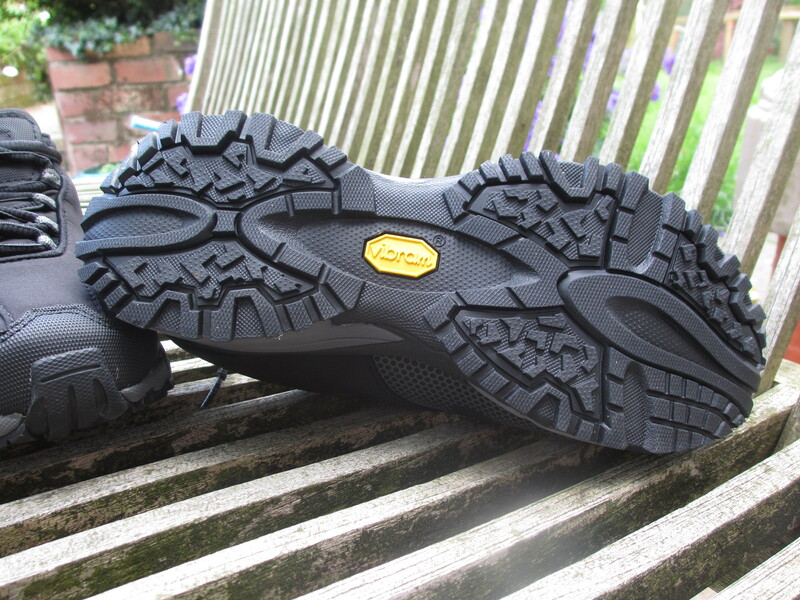 The sole is made by Vibram. A name familiar to me for its Fivefinger barefoot running shoes. They obviously know a thing or two about soles so I was keen to see how they performed. It’s a firm sole with a medium depth tread and it’s great. No slipping, even on the wet river stones. Good grip on the dusty track and on pure mud. Can’t fault it. This is made of a material called Phylon, a blend of EVA (ethylene-vinyl-acetate) used in many top brands of running shoe. It’s a rubbery substance known to be comfortable and flexible and to age well too. My foot certainly felt snug and my foot arch well supported. There was definitely a spring in my step and I felt well cushioned from the stones beneath. This is where I think the strength of the shoe lies. It’s insanely waterproof. The fabric resembles that of a wetsuit and water literally rolls off it. The lining is called tres-tex and is breathable and waterproof. 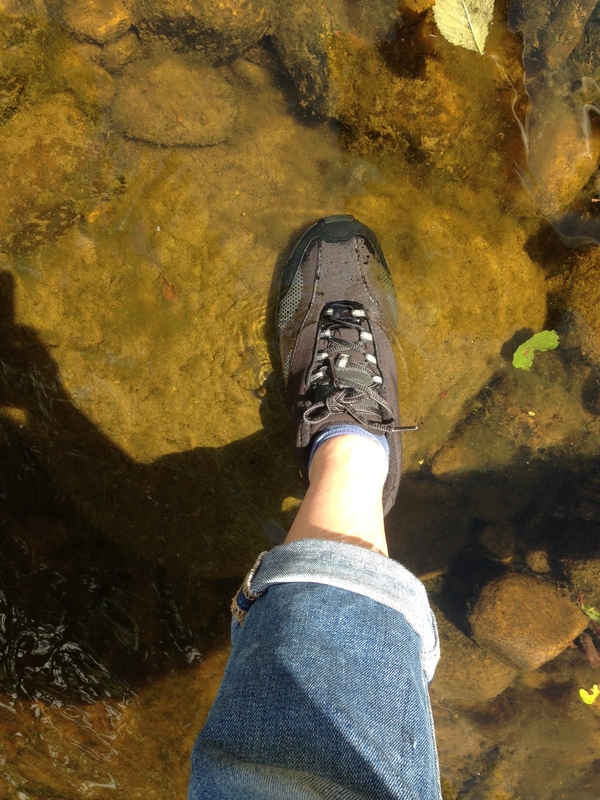 I almost fully submerged my foot in the river (it’s hard to tell this from the photo as the water is so clear!) and my socks stayed completely dry. Running through wet grass- not an issue. No sweaty feet either due to the breathability, even on the hot sunny run. If I had to change anything? I’d reduce the bulk of the tongue a little and add an extra shoe lace hole near the top so I could fit it more snuggly to my upper foot. I’d also add a few highlights of colour. The yellow of the Vibram label contrasted nicely with the black and to have some of this yellow elsewhere such as on the lace loops would look great. I have to admit I’m impressed. I’ll recommend this to my running group many of whom are beginners and wanting to buy their first trail shoes, needing a great shoe but not wanting to spend the earth. 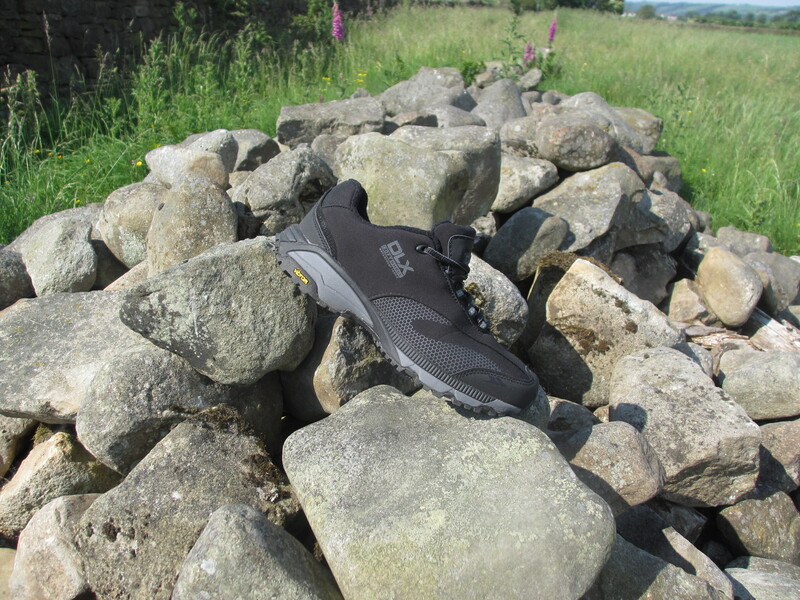 This is a comfortable, sturdy trail shoe suitable for the toughest of conditions with excellent grip. It’s also perfect for those who like dry socks! I’ve never thought of trespass for trainers, so consider me enlightened! I agree though, more colour needed (although when I go back to work at the NICU they do like us to wear plain black shoes with our scrubs so these would work a treat), but for running its nice to have a splash of colour. Happy to enlighten! Hope you have a smooth return to work. You’d be first to a crash call in these. Previous PostSummer sandals and runners’ feet.